For a priest, being can be as important as doing – and it is good for the priest and for the congregation seeing the priest at prayer and a participant in the Eucharist, robed and without needing to be the celebrant, the preacher or to assist as a deacon, sub-deacon or reader. I have been busy on Sundays for the last few months in a number of parishes, and so this morning I spent half an hour before the Eucharist in Christ Church Cathedral in a cope and then taking my place in the chapter stalls for the Cathedral Eucharist, robed in an alb and stole, but otherwise there as a member of the worshipping congregation. It may even predate the rest of the Divine Liturgy of Saint James, going back to at least 275 AD. The version known to Anglicans today was translated from the Greek by the Revd Gerard Moultrie (1829-1895), chaplain at Shrewsbury School. The hymn became popular after Ralph Vaughan Williams provided an arrangement in 1906 for the English Hymnal of a French carol or mediaeval folk melody, Picardy, found in Tiersot’s Mélodies in Paris in 1887. Later, two of us had lunch at Chez Max, a Parisian-style bistro in Palace Street, tucked into a corner of the walls of Dublin Castle. We sat through a mixture of summer sun and autumn rains, and were amazed by the resilience of passing tourists who carried on without any worries about the changing weather. From there, we went to Mount Jerome Cemetery in Harold’s Cross to place a poppy cross, marking the centenary of the outbreak of World War I, on the grave of Patrick Culley, who spent the war with the Royal Army Medical Corps in the trenches in France. For part of my childhood, I lived in a house in Harold’s Cross where my bedroom at the back looked out across Mount Jerome, which has been compared with Père Lachaise in Paris and Highgate in London. But in places it is evocative of the volcanic-preserved remains of Pompeii or Herculaneum. In 1834, the General Cemetery Company of Dublin bought Mount Jerome, and the cemetery was founded in 1836. The Funeral Chapel, designed by the Cork architect William Atkins (1811-1887), was the first Pugin-style Gothic church built in Dublin. 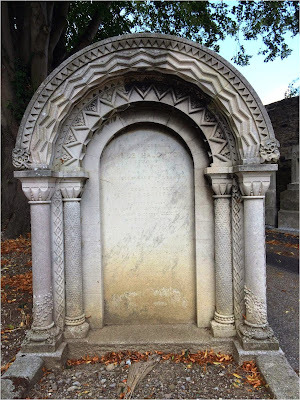 Mount Jerome includes some of the finest Victorian sepulchres, vaults and graves in Ireland. Many of these include statues of weeping widows and orphans, or are based on fantasies of classical Greek temples; some are decorated with Masonic symbolism, others with the sculpted images or coats of arms of the dead, and one is even topped by a hound who appears to be howling at the moon after the death of his master. The social reformer James Haughton (1795-1873) was born a Quaker, but for most of his life was a Unitarian. Yet his gravestone appears to have been inspired by the Romanesque doorway of an ancient Church of Ireland cathedral. There are graves designed by sculptors, like Thomas Kirk (1781-1845) and his son Joseph Robinson Kirk (1821-1894), who must have been aware of their own imminent death, the graves of politicians like James Campbell (1851-1931), 1st Lord Glenavy, and the writer William Carleton (1794-1869). There are the grave of eminent Victorians and many clergy of the Church of Ireland – although I am surprised so many are buried here and not in their churchyards. Mount Jerome remained a mainly Protestant institution for decades, although this included Unitarians and Quakers – there is one row of members of the Bewley family. Roman Catholic have been buried here only since the 1920s, and in a corner close to the small car park at the entrance is the earliest burial plot in Ireland for Muslims. Scattered through the graves are stones and memorials recalling many policemen, and the graves too of many soldiers and officers from World war I and War II. From Harold’s Cross, we drove to Lucan and spent some time late in the evening walking by the north bank of the River Liffey, before returning back across the great metal bridge, and walking on the south bank of the river, close to the Liffey Weir, watching the river as it thunders and cascades down toward Chapelizod and the city. The weir is a popular spot for canoeists and is one of the most challenging parts of the annual Liffey Descent. On the opposite bank of the river, beyond the weir, is a terrace of redbrick houses called Weir View cottages, built for the workers at nearby Hill’s Mills. There is more to discover in Lucan, but the evening was beginning to grow colder, and we returned home resolved to see Lucan soon again.